Rise of the Triad was a classic first-person shooter from Apogee Software, released in 1995, a time when the genre was getting more and more attention by the day. Sadly, this game never got the sequel it deserved, although in 2009 there was some talk of a contemporary reboot. 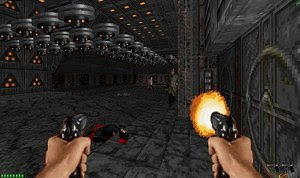 Return of the Triad is a total conversion that runs in the freeware ZDoom engine (download mandatory to run this game) and that acts as a sequel, being set 5 years after the events in the original game that led to the destruction of the monastery. The game is light in story and this is basically a reason to place us in fights against triad members using all the original weapons from Rise of the Triad. The enemies are also the same from the original game, as well as some of the traps. Half sequel, half homage, Return of the Triad is a welcome revisit to a classic of the ‘90s.